You'll have gathered from the blog pages that the sea fishing has been a bit on the thin side for a while. I was beginning to think that it was just me (paranoia I believe they call it!) but an exchange of emails with my pal Eoghan in Ireland made me realise that other people also suffer unlucky spells. Hope you are keeping well. I was just wondering if you have had many outings recently..? or heard of many Bass being taken..? We’re off to Kerry in two weeks time. The general feeling at the moment is that its just too cold and bass are feeding very little due to low metabolism and time taken for food to digest etc. Very few people catching anything from what I can see in reports, very sporadic. We are going to target bass and seatrout and see how it goes. 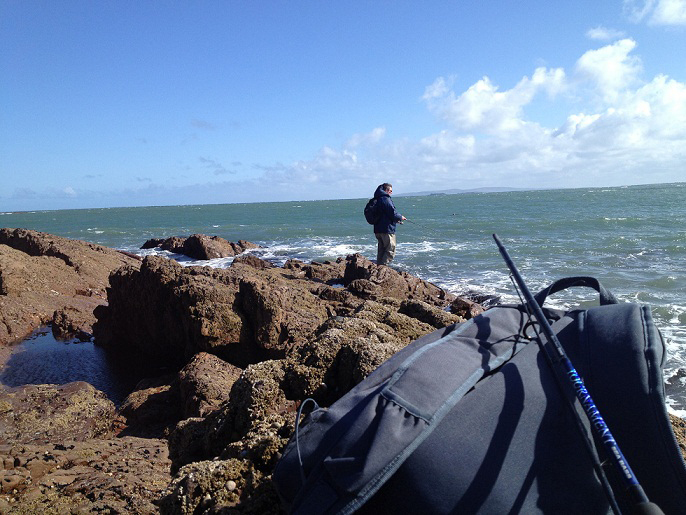 Weather due to improve in the next 2 weeks and we are fishing a very big spring tide so fingers crossed. Will let you know what happens. I will let you know how we get on in Kerry. We'll be fishing most of the day at some tide on some location so it won’t be for the want of trying. So Mike, I’ll let you read for yourself. You can see from one pic how murky the water was. It was also very cold. It's so disappointing when a weekend planned for so long turns out like this. But you can always learn from it. I had been counting the minutes from about 10 weeks away. It was our usual journey to Brandon to target bass before the closed season. We knew it was going to be tough having seen the forecasts and the recent fishing reports. It turned out to be one of those weekends where everything goes wrong. The plan was to head down on Thursday morning around 9am and leave on Sunday afternoon. Plenty of tides to fish and lots of options. I woke on Thursday morning to the cold wind and rain hitting the window. Not a good start. Then a family crisis meant that I'd be coming home on the Saturday. So we head off and in the back of my mind something is telling me to cancel it and do it in late June. Anyway we get to Brandon, the water is a murky brown, the wind is freezing and there is weed, lots of it. My brother in law who went down on Tuesday landed 3 trout while we were travelling down so that gave us some optimism. We fish literally all day when we are not eating or having a pint. Every tide you can think of, rising, dropping, and various marks. Not a sniff of a bass. 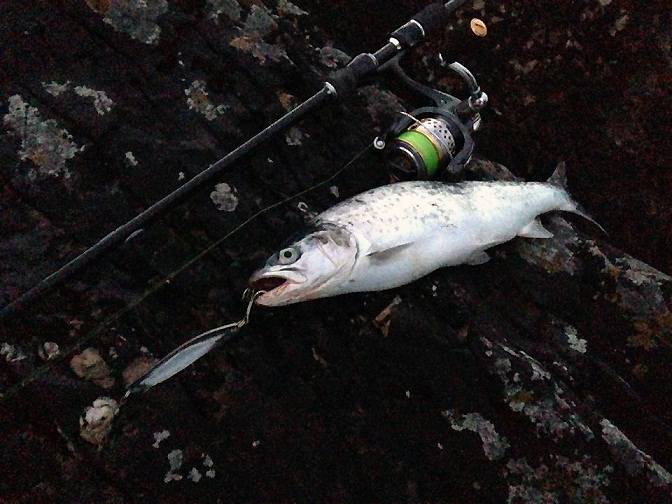 My mate takes a nice trout off a rock mark which is about the only mark I know where there would be some clarity due to the surge and swell there. Great bass mark but not a sniff. 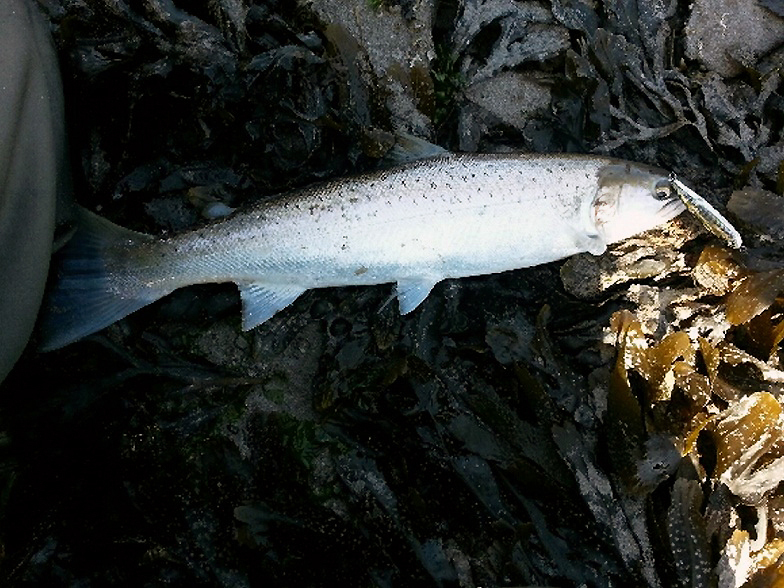 We then focus on the estuary as it’s the only place clear enough and producing fish. My bro in law takes a trout and a flounder on a lure, not foul hooked - clearly went after the lure. My other mate takes a trout and im beginning to think there is a cloud over my head..! I then get a txt then from the wife to say she has been up since 04:00 with the twins who are sick. At any moment candid camera are going to jump out and say the whole thing has been a setup..! So as the fishing is not great, and because of sick kids etc I decide to head home. The lads do too as we are really after bass and the trout are pretty small. So we are all in the cars by about 12 on Saturday afternoon. Now the one good thing about the weekend was meeting up with Steve from the forum. We had a chat over a mark we met up on and it was great to put a face to a name after we have exchanged lots of PM's. This is where the straw broke the camel’s back. Half way home I get a txt from Steve to say he is fishing a mark and hammering bass...! There was minor damage to the dash board and the doc tells me the hair will grow back in time..!! So there it is. I blanked.....for the first time ever in Brandon I blanked. Unheard of! No bass either between 4 of us. Well I thought I was unlucky!!!! That,as they say,is fishing (more like life really)!!!! It's been pretty grim here but nothing like as bad as that. I went fly fishing that morning (04:00hr) and nearly got washed off my ledge after I'd had half-a-dozen casts so I went home. Hopefully there'll be another day. At least they had a few trout and flounders. It shows that it's not just me who's struggling.